The Water Division of the MCMUA has been providing high quality potable water to portions of Morris County since 1958. The MCMUA has developed a complex system of wells, pumps, tanks, and pipelines to deliver water from underground aquifers to its wholesale customers. 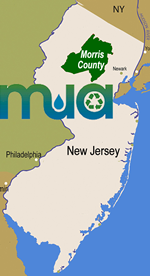 The MCMUA is a bulk water provider, meaning it supplies water to municipalities and other local water companies and they pipe the water directly to Morris County residents and businesses. Indirectly, the MCMUA serves approximately 35,000 people or 8% of Morris County. All MCMUA water emanates from underground aquifers located in Mount Olive and Randolph townships using wells, and then the water is pumped to the surface and distributed to the MCMUA's wholesale customers. The MCMUA does not sell water directly to individual residents, but wholesales it to other water purveyors. Anyone who has a question regarding his/her individual water bill should contact the company listed on the bill or the municipality where he/she resides.